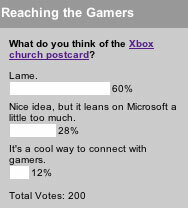 In last week’s poll we asked about the Xbox church postcard we saw back in February. The majority weren’t impressed, with 60% saying it was lame. 28% liked the idea, but thought it copied from Microsoft a bit too much, a topic we’ve discussed before. This week we want your feedback on another bit of church marketing, the monster truck radio ad.